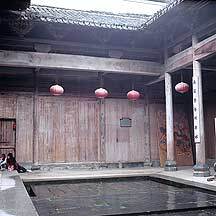 南屏Nanping had its beginnings during the 元朝Yuan dynasty (1271-1368) as a small village whose southwest background is the 南屏山Nanping Shan (Nanping mountain), hence the fate of the village's name. 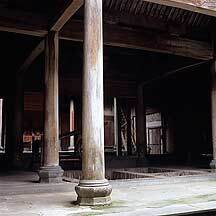 Near the end of the dynasty, a man settled here and started the dominant 叶宗族Ye clan. 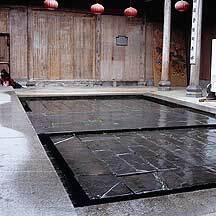 By the 明朝Ming dynasty (1368-1644), two major clans joined in - the 程Cheng and the 李Li. Due to these clans competition, the village developed rapidly. 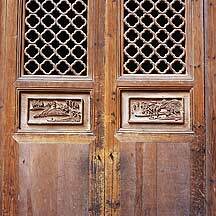 Today there exist some 300 Ming and Qing houses, among them are 8 ancestral shrines, 72 alleys, and 36 "eye-wells". While I was there, I lived in a building of the Ye family. 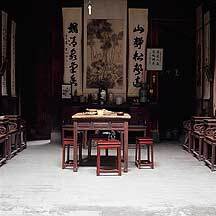 Mr Ye told me there were about 400 households here, most of which are of the Ye clan, with a population of a thousand. 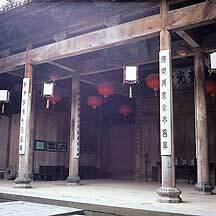 And that the village had been openned to public for about 6-7 years, following 西递Xidi and 宏村Hongcun in the 1990s. 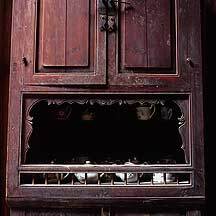 关麓Guanlu was last, following Nanping. 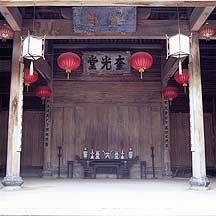 Nanping's main historical attractions are its ancestral shrines, built from wealth gained through official positions; among them are the Ye's 叙秩堂Xuzhitang and 奎光堂Kuiguangtang. 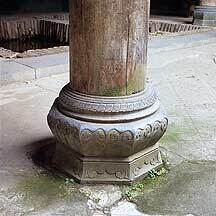 Inside these shrines are their unparralleled wood pillars, which are massive in their appearance and weight and are supported with carved stone bases. 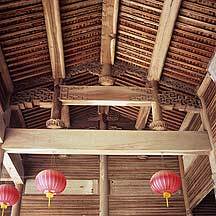 Both are built during the Ming. 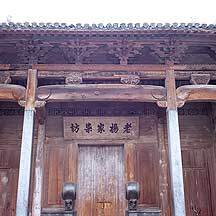 Its other distinct designs are its 眼井"eye-wells"; these are wells with 3 small bucket-size holes in its mouth rather than one large openning - so that a small child will not fall in. 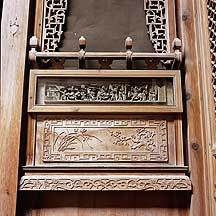 Also of interest are its numerous maze-like network of narrow lanes, which are said to be 72 in number - a Daoist magical number, like the 72 peaks of 黄山Huangshan mountain or the 72 transformation of 孙悟空Sun Wukong, the monkey lord of the great Ming novel 西游记Journey to the West. 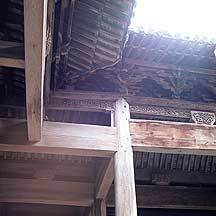 Nanping is not nearly as big as Xidi or Hongcun, but its alleys are more varied, less even and have different heights and levels to move up and down. 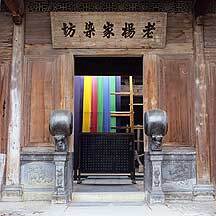 南屏Nanping is in 黄山市Huangshan city's 黟县Yixian (Yi county), so one usually get a ride from there to the village. There are buses to both 黟县Yixian (Y9 and takes about 45mins - 60mins in 2006) and 歙县Shexian (Y5 and takes about 30mins in 2006) counties from outside 屯溪Tunxi's bus station. Be aware that the counties are in the opposite directions, so confirm with the driver that it is going in your destination. see map. 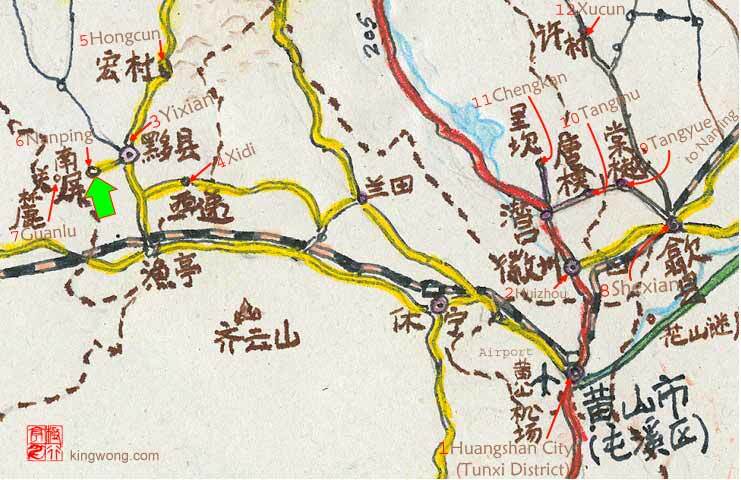 From Yixian, there are public buses(Y2 - Y3 and takes about 30mins in 2006) to the villages, whicn includes 西递Xidi, 宏村Hongcun, 南屏Nanping and 关麓Guanlu. At the time I was here, the road to Nanping was under construction (summer 2006), so it took longer than normal to get there. The public buses normally waits from across a short stone bridge not far from the bus station. Signboards with the name of the villages are usually placed on the driver's front window; if not, confirm with the driver that it is going to your village. If you are in a hurry and there is no public buses there are always plenty of minivans for hire that will take you there(about Y15). 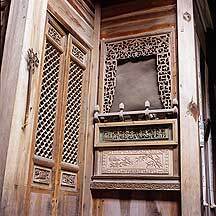 Other alternatives are to hire a van in Tunxi (the old trading town within Huangshan city) and go straight to the village. This may cost alot more(probably about Y100), but if you have several people this may be much faster and easier. 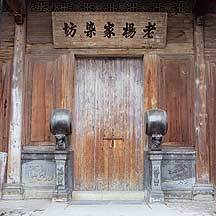 Guanlu village is just 10 - 15 mins. 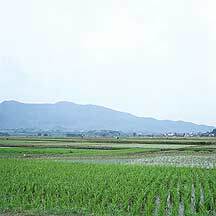 west of Nanping, I highly recommended that you visit this small village before too many people knows about it. Family-style guesthouses and hotels are easily available here. The cost was usually Y20 and up. 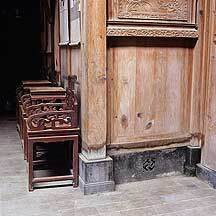 Nanping had about a thousand residents in 400 households. So it is a decent size village with enough activities to keep you busy for a day. During the high seasons, there can a large number of tourists. At the time the village hosted two art schools, so expect plenty of students. 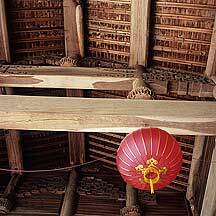 Foreigners or non-Chinese, need to get a permit to see these places. The permit can be obtain from Tunxi's PSB. As I have never looked at one, I don't know what is involve. Inevitably, there is a fee, which I had read to be about 60 yuan. Just be sure that the permit has the places listed on the permit.